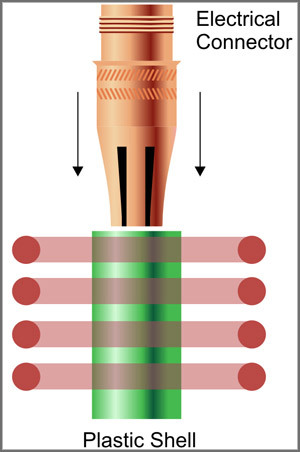 The objective of this induction heating process is to bond a threaded brass electrical connector to a plastic hollow plastic shell in an open-air atmosphere. 3 kW RF power supply, four-turn helical inductor (coil). The testing was done in an open-air atmosphere. A specially-designed, four-turn helical inductor was used to provide optimal heating to the end of the electrical connector. Initial tests were conducted with bare parts and temperature sensing paints to establish time-to-temperature and heating profiles. The plastic shell was positioned inside the inductor and parallel to the top inductor turn. The brass connector was carefully positioned on top of the shell and a small 3-5 lb force was applied to the top of the connector. RF induction power was applied for approximately 10 seconds, first causing the connector to heat up and then gradually causing the plastic around the edge of the connector to reflow. Because of the slight downward pressure and the reflow of the plastic, the connector slowly dropped down inside the shell until the end stop was reached. The assembly was then removed and allowed to air-cool. Consistent, repeatable results were achieved at 500°F with a 10 second heat cycle. The electrical connector was firmly bonded to the plastic shell without any flashing or discoloration. Heat staking is an excellent application for induction heating. Consistent results were achieved with a 10-second heat cycle.